Escape the crowds and cities and choose the Chaslands Village as your home base, home to the "Whistling Frog Resort", our favourite place to stay. It is the most centrally located establishment to all of the Catlins attractions and makes for a perfect holiday destination. It is only 400m from the Cathedral Caves, 3km to the tallest waterfall in the Catlins, McLean Falls, and within minutes to Tautuku Beach and more! It is the perfect home-base for all your sightseeing and photography requirements, including Free Wifi. They even offer "Photographic Tours" of the Catlins, so you can get the most out of your experience, with great photographs to take home and show your friends. 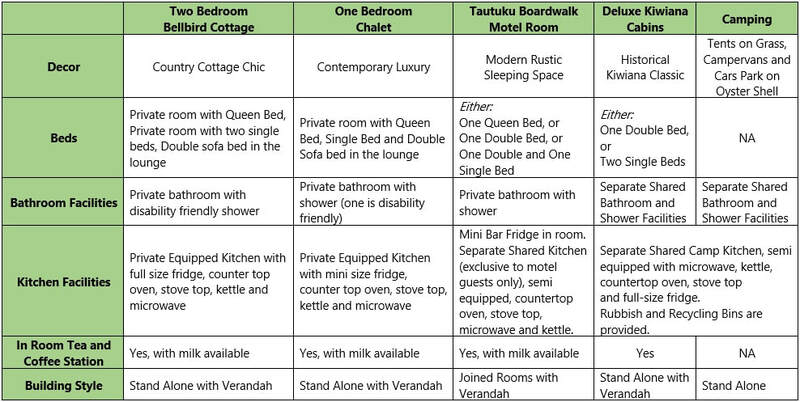 powered van site, dorm room or cabin; or if you want to treat yourself to a Tautuku Boardwalk Motel room with private en-suite bathroom or a fully self-contained Rainforest Chalet, Cottage or the full "Kiwi Bach Experience". Relax, unwind and pamper yourselves! "The Whistling Frog Cafe & Bar" is available for all your Breakfast, Lunch & Dinner requirements, we'll even do the dishes! The Whistling Frog Cafe & Bar" has also been featured in the "NZ Cafe of the Year 2013, 2014 and 2015" Competition as well as the "Supreme Pie Awards 2014". Wifi available, complementary DVD Hire, Hot Showers, Power, fresh Drinking Water (we collect our own rain water and triple filter it to bring you the purest drinking water around, without having to boil it first), Convenience at your doorstep, a Quiet and Comfortable nights sleep as well as access to cooking facilities and the Whistling Frog Cafe and Bar. You will also enjoy exclusive guest happy hour for reduced priced beverages!